I received an email mid week, telling me that the sender had photographed 10 different species of bird at the Peter Murrell Reserve at Kingston, and all that in a few hours. Having not visited this reserve in several months, it was tempting, but I know only too well, that trying to emulate someone else's experiences, is almost always fraught. However, Friday morning was one out of the box, with very light winds and a fine forecast, and, from my experience, an ideal day for a visit to this reserve. It proved a great choice, despite the date! I arrived early, and with an air temperature still in single digits, and lightly overcast, realised that I was going to be "under dressed" for th e first hour or so. But there was an upside to the temperature, as a number of birds were using the fence line to hunt from. The first bird that I noted was an adult Swamp Harrier, making forays to catch insects from a distant fence post. Nearer, were families of Welcome Swallows, also pouncing on still grounded insects. I stopped to take numerous shots of both adults and juveniles, both seemingly reluctant to move from their vantage point. 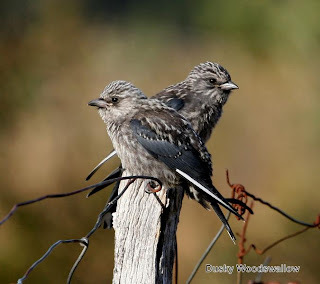 Further along the fence wires, were numerous young Dusky Woodswallows, also waiting for a feed from their parents, although obviously quite capable of catching insects for themselves. A familiar call caught my attention, as a family of White-fronted Chats flew over, not a species that I expected to see here, but they're great nomads, and were probably in transit! Disturbing some Green Rosellas feeding in a nearby shrub, their alarm call in turn flushed 2 Blue-winged Parrots, feeding in among the dry grass. Rarely managing to photograph these parrots, I set off in pursuit. As often happens, this proved fairly pointless. I would hear their tinkling calls coming from a nearby shrub or tree, but their colouring made them almost invisible, and I only saw them after flushing them. I gave up. The "chase" was not entirely wasted though, as I recorded New Holland Honeyeaters, Silvereyes, Brown and Yellow-rumped Thornbills, Superb Fairywrens, Scarlet Robins, Australasian Pipits, Tree Martins, Grey Shrike Thrush, Grey Fantails, and numerous families of Goldfinches. It was, as the email had implied, really 'humming". After abandoning the bluewing chase, I walked into the nearby lightly forested areas, around the presently dry creek line, looking for the Forty-spotted Pardalotes that I usually see at this spot. I could hear a small group of Spotted Pardalotes, and I had already seen a few Striated, all in the tree canopy, but it took a while to find the Fortyspots. I finally found them, but at this juncture, I was faced with a dilemma. The bluewings re-appeared, and quite close by. The fortyspots were nearly close enough to get a few shots, do I leave them and try for the bluewings? The bluewings won. I reasoned that the fortyspots are here virtually all the time, the parrots only briefly. I managed several shots of the bluewings, and had the bonus of photographing an adult Pallid Cuckoo in the same thorn bush. The latter being dive bombed by Welcome Swallows and Dusky Woodswallows. I still managed to 'scramble' a few shots of the, by now, parting fortyspots, as well as a juvenile Fantailed Cuckoo. By mid morning I had had my 'fill', and wandered back along the fence line, now devoid of birds. Back past the second pond, now sporting a flock of Wood Duck, but I still had one "photo opp" to come. As I neared the upper pond, a flock of around 30 Masked Lapwing took to the air, calling raucously. I guessed they'd spotted a raptor, which indeed they had, a juvenile Swamp Harrier. Unlike the adults, juvenile Swamp Harriers are dark brown, looking almost black at a distance, and I watched this one as it neared. I'd hoped it would quarter the area along a nearby ditch line, and for a change I guessed correctly. It passed probably 50 metres away, and I managed a few shots before it was obscured by nearby trees. A great way to end a memorable morning. The above are a small selection of the many images that I took. I only wish you could have been there! Certainly a good morning for birding - and great photos as usual. Nice to have you back blogging! Well, reading your story, it seemed I was there with you. 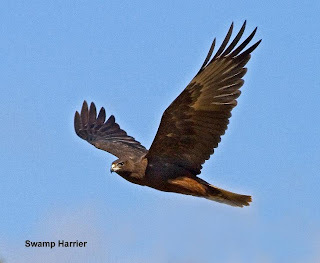 Great birds, especially the Blue-wings, but the Swamp Harrier was great too. So glad you have posted again. Sounds like you had a wonderful morning. oh - I meant to say - I like how you are putting their names on their photos. 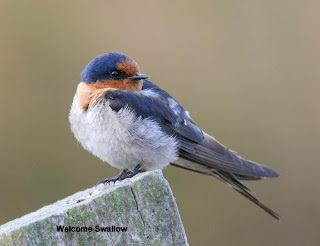 That Welcome Swallow is an early contender for "cutest bird of the year". Belated thanks to you all. It's a battle sometimes to be bothered to blog things, but this morning was one out of the box. I'm not heavily into "cute" Kris, but I did take a large number of shots of Welcome Swallows--mainly because they are very 'twitchy' when you're only standing a few feet from them, and many shots don't make it. I'm sure I have "cuter" ones! I go to the reserve often, and now you've helped me identify a few more birds by confirming the ones I thought I saw. I saw many birds this week on the Howden side of the reserve, unfortunately I had to deal with kids on motorbike near the ponds so I have been sticking to the edges of the park. Thanks! I am happy to have found your blog. 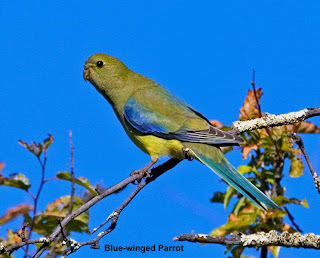 Well done Alan, managing to photograph the forty spot and blue winged parrot. Both species have usually long gone before I've sorted my camera out. 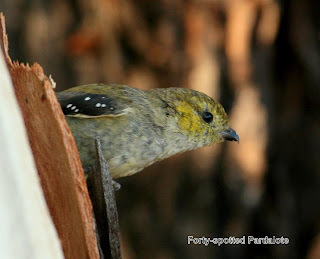 Do you have any hints in identifying the sound of the forty spot from the spotted or striated pardalote. I did see three juvenile forty spots having a right old squabble at Tinderbox near the old battery last week. Sometimes one is just lucky! I ended up taking shots of more than 20 species,(some pretty ordinary images), and such a glorious day weatherwise. As far as the 40 spot call goes it's not easy describing it, but it's, IMO, quite unlike other pardalote calls. I tried putting the right words together and decided on "harsh, discordant, monotonous, frequently repeated, double note" and fairly quiet, Worth finding some calling because it's an easy one to remember once you've heard it. The squabbling may be the youngsters pairing up, where birds constantly chase one another--a case of avian sexual harassment perhaps!